﻿ Do opossums climb trees or live in trees? In order to understand where possums live, it would be better to understand their way of living. Possums are primarily nocturnal mammals, which means they are primarily active during the night. They start searching for food after the dark and until dawn. They may become active in the daylight hours during winter when it is not easy to obtain food. Generally, possums live in wooded areas or near them, and especially in wooded areas close to water. They are usually found in urban areas. Possums do not build their own shelters, instead, the take cover in dens and nests which are abandoned by other animals like skunks or foxes. Possums will also search and take cover in sheds or in old buildings, in the cavities within rocks, in brush piles, in hollow trees, or even fallen logs. When they find shelter, they will carry nesting material into it. Possums are terrestrial animals. This means that almost all their time is spent on the ground and not in trees. If they are seen climbing up into trees, it would be because they are either escaping a predator or they are searching for food. Possums are not like birds and do not sleep in the branches of the trees. They are like other mammals that make dens in different places on the ground, and they curl up and sleep there, protected by their den. Learn how to identify opossum tracks on your property. So, possums can climb trees but they do not live in trees. They will either build a rough nest or they will find a den where they can rest during the hours of the day. Their den can be an abandoned burrow, an underground tunnel, the cavities in hollow trees, the nests abandoned by squirrels, the crawl spaces under houses, some hidden spaces in buildings which are dark, attics, or any other dark space which they can find. They will search for spaces which are dark and dry. 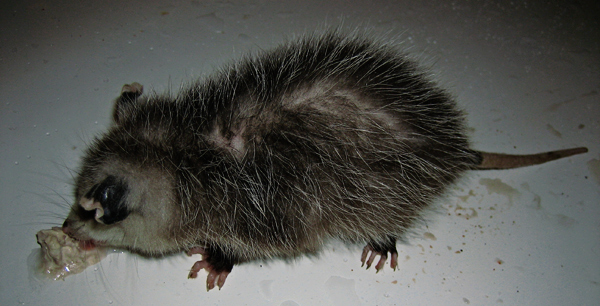 One possum can have several dens which are used periodically. However, female possums with young will use the same den for several weeks. The dens can be lined by grass or by thin twigs and dry leaves. In warm months, their dens may be similar to a bird’s nest, while in cooler and cold months it will resemble to a mouse or squirrel’s nest as it becomes like a hollow sphere. Find out whether or not Opossums Hibernate.